Percy Lionel Holt was born in 1896 in Yeovil, the son of printer's compositor William Mears Holt (1861-1915) and his wife Mary Sarah née Poole (1862-1955). The 1901 census listed William and Mary living at 47 Vicarage Street, almost on the corner of Quidham Place, with their children; 11-year old William, 7-year old Mabel and 5-year old Percy. The family were at 42 Vicarage Street in the 1911 census and by this time 15-year old Percy was listed as a GPO telegraph messenger working at the Post Office which, at this time, was in Middle Street (now occupied by WH Smith's). Later, Percy was to work at the Nautilus Works in Reckleford. At the age of eighteen Percy enlisted in the Army in 1914 at Yeovil and became a Private (Serial No 240821) in No 2 Company, 1st/5th Battalion, Somerset Light Infantry. He was to serve three years in India, achieving the rank of Lance Corporal, before going to Palestine with the Battalion. The Regimental History of the Somerset Light Infantry records "Several weeks training at El Arish and Rafa, where long route marches through the burning desert fitted the battalion for the part it was to play in the near future, followed on 28 August Nos 1 and 2 Companies of the Battalion went into the trenches in the Sheikh Abbas area, south of Gaza (see first two photographs below), and were attached to the Argyll & Sutherland Highlanders for preliminary instruction in trench warfare. The remainder of September was uneventful. The Regimental History of the Somerset Light Infantry records the detail of the Action of El Mughar and the part played in it by the 1st/5th Somersets, including Lance Corporal Percy Holt of B Company (also known as No 2 Company) - "On the 12th the Battalion moved forward and occupied a ridge south of El Kustineh and El Turmus, digging in and remaining in the position during the night of 12th/13th. The task allotted to the 233rd Infantry Brigade in the attack to take place on the 13th November was the capture of Tel El Turmus - El Kustineh (both inclusive) with El Mesmiyeh as a further objective. Casualties suffered by the 1st/5th Battalion of the Somerset Light Infantry during the fighting on 13 November 1917 were one officer and five other ranks, including 21-year old Lance Corporal Percy Holt, killed and two officers and 41 other ranks wounded. 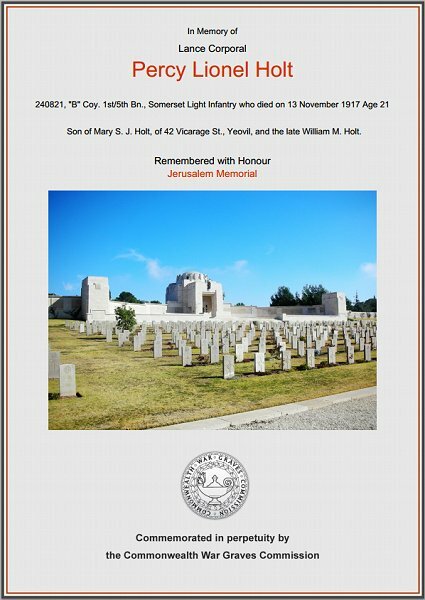 On 30 November 1917 the Western Gazette reported "Mrs Holt, of 42 Vicarage Street, has received the official intelligence that her son, Private Percy Holt, Somerset L.I., has been killed in action in Palestine. Deceased, who was only 21 years of age, served three years in India before proceeding to Palestine. Before enlisting he was employed at the Nautilus Works." Percy Lionel Holt is commemorated on Panel 17 of the Jerusalem Memorial. His name is also recorded on the War Memorial in the Borough. The Commonwealth War Graves Commission certificate in memory of Percy Holt.